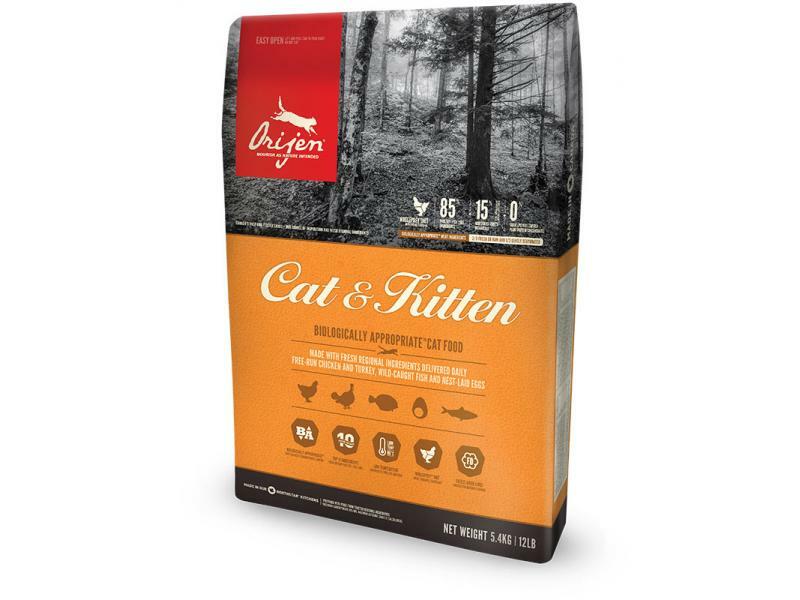 Glucosamine & Chondroitin - Orijen’s fresh poultry, meats and fish provide a rich and natural source of glucosamine and chondroitin, so no synthetic sources are added to Orijen cat foods. Boneless chicken*, chicken meal, chicken liver*, whole herring*, boneless turkey*, turkey meal, turkey liver*, whole eggs*, boneless walleye*, whole salmon*, chicken heart*, chicken cartilage*, herring meal, salmon meal, chicken liver oil, chicken fat*, red lentils, green peas, green lentils, sun-cured alfalfa, yams*, pea fibre, chickpeas, pumpkin*, butternut squash*, spinach greens*, carrots*, Red Delicious apples*, Bartlett pears*, cranberries*, blueberries*, kelp, licorice root, angelica root, fenugreek, marigold flowers, sweet fennel, peppermint leaf, chamomile, dandelion, summer savory, rosemary, Enterococcus faecium. Vitamin A, vitamin D3, vitamin E, niacin, riboï¬‚avin, folic acid, biotin, vitamin B12, zinc proteinate, iron proteinate, manganese proteinate, copper proteinate, selenium yeast. There are currently no questions for Orijen Cat & Kitten Food - be the first to ask one!